Sharp this week demonstrated its first 31.5-inch HDR display featuring a 7680×4320 resolution and a 0 Hz refresh rate. The monitor uses the company’s IGZO technology and the manufacturer evaluates plans to release this LCD commercially. Being one of the key backers of an 8K resolution as well as the Super Hi-Vision format, Sharp was among the first to release 8K screens and 8K cameras for professionals as well as 8K UHD TVs for consumers. Several years ago, Sharp demonstrated its first 27-inch 8K IGZO monitor with a 0 Hz refresh rate and 1000 nits luminance, but the device has never been released commercially (at least, it has not been available in stores). This week the company showcased another 8Kp120 display. 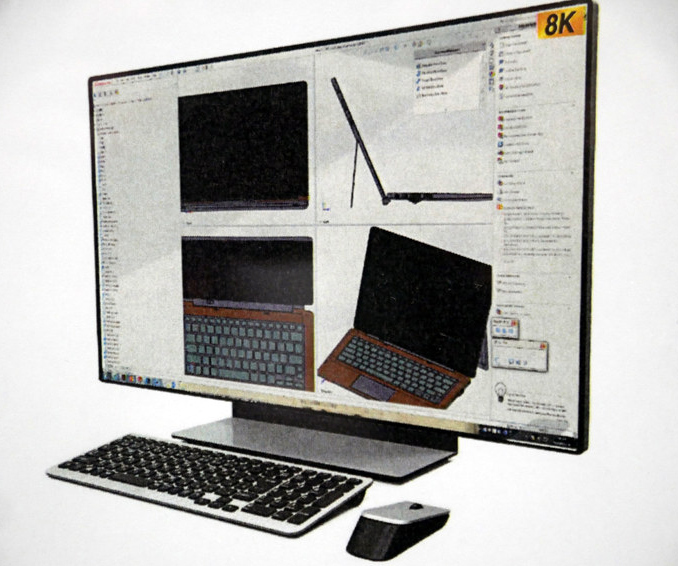 Demonstrated at a special media event in Sharp’s headquarters in Tokyo, the new prototype is a 31.5-inch IGZO LCD featuring a 7680×4320 resolution, 800 nits brightness, and a 0 Hz refresh rate. The new monitor is larger than its predecessor, yet features a lower pixel density, and lower luminance, so it should be a bit easier to manufacture (at least from cooling and PPI points of view). Sharp did not disclose many technical details about its new 31.5-inch 8K LCD, yet the company is considering to launch it commercially. Meanwhile, one of the key questions is how the display will connect to host machines. To feed its 27-inch 8K monitor with data (7680×4320 at 10 bits at 0 times a second requires a minimum bandwidth of 0 Gbps or 15 GB/s), Sharp had to use eight DisplayPort cables back in 2016. VESA started to certify DP1.4 with HBR3 (DP8K) 32.4 Gbps cables in early 2018 and their use could reduce the number of DP connectors needed for 8Kp120 monitors. Usage of four cables is still too complicated for the mass market, yet it is acceptable for professional applications.